What has been the root of the U.S'. inability to develop a sustainable policy or strategy on Iran for the last 30 years? What was not learnt from the Shah's fall in 1979 and the nature of the revolutionaries who hijacked a pro-democracy freedom movement? And what are the parallels between the Shah's regime and the current Islamic government in Tehran? These are the types of questions that have been raised in my extensive interview with Dr. Abbas Milani, author of the recent book, The Shah, and the director of Iranian Studies at Stanford University in California. While the Iranian government continues to curb social and political freedom in Iran, particularly after the post-presidential unrests which resulted in killing of dozens and arresting thousands of people, the author of a recent book, The Shah, provides a comprehensive image of parallels that contributed to the fall of the Shah and is now being perpetuated by the Islamists in Tehran. "If we understand why the Shah of Iran fell in 1979, we can understand why the Iranian government is unstable today and based on that, predict what the future of the country could be", Milani told me on the significance of reading The Shah. 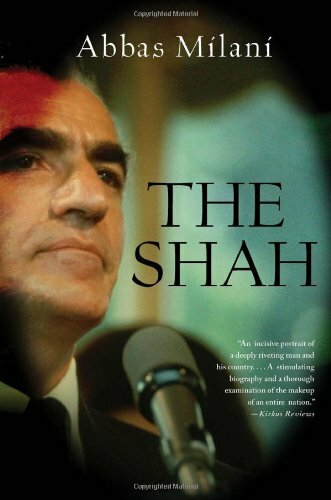 The book, which is based on more than 400 interviews and newly-released documents by the American and British embassies, also gives very interesting, first hand information and documented accounts of the way the Shah really was and how we should look at him and Iran's politics today. The 1953 coup and the forces that contributed to such a significant political incident, a view of US-Iran relations and the failure of US intelligence to read Iran's politics are also discussed in the interview. Memarian: Why is learning about the Shah still important three decades after the creation of the Islamic Republic? Milani: Well, I think for two reasons. One is historic in the sense that he is a very pivotal figure of the twentieth century. There is also room for an impartial biography of him now, based on documents that have only become available the last few months. Politically, I think this is necessary, because in my view the same dynamic, both in terms of the coalition of forces and in terms of political demand, that overthrew the Shah in 1979, have been the cause of more or less incessant unrest and instability in the Islamic Republic in the last 30 years. That coalition wants democracy, and the usurping clerical establishment essentially aborted demand for democracy and the same coalition continues its, now 100-year-old, dream of democracy. So, if we understand why the Shah fell, we understand why the regime is unstable today and I think we can, based on that, predict what the future of Iran will be; that the current status quo is untenable because it's going against the grain of what the people have empirically shown they want. Memarian: How about the Shah's relation with his opponents and allies inside the country? Milani: The Shah had a completely misguided understanding of who his foes and his friends were. He thought that the left and nationalists were his enemies and he thought the religious forces, minus the radicals of course, were his allies. He went after the radicals, and allowed the creation and in fact the enhancement of the incredible network of mosques, hosseineh's [religious gathering places], and Quran readings programs throughout the country. I found some remarkable statistics on the number of mosques, for example, that were built in the last decade of the Shah, and when you compare that to Reza Shah, [the Shah's father], who literally cut to a third the number of mosques, and to about a third the number of Talabe's [students of seminaries] you see that the Shah had a scorched earth policy against the left and against the center and he allowed the clergy to organize, mobilize, train their Cal Grads, have their schools, collect their funds and when the system went into crisis, that force was the only force that could keep the country together and the Europeans and the Americans decided that they should make peace with [Ayatollah]Khomeini, [the founder of the Islamic Republic]. The book shows very clearly that Khomeini volunteered contacts with the Americans, he answered their questions; and he advised his allies in Iran to negotiate with the American Embassy. So, in almost all of these phases, the reality, at least as far as I have uncovered, is very, very different than what has been, so far, assumed about it. Memarian: How is it different than the current government in Tehran in dealing with peaceful protests? Milani: If you look at the number of people killed as a result of assassinations, or through execution by the Shah's regime, the total number is less that 1,500 during his 37-year rule. Ayatollah Khomeini ordered the death of 4,000 people in prison, in a few months in 1988. Memarian: Regarding your facts and understanding on the Coup, how can we draw a line between the reality and the myth about the Coup, which has occupied the historical memory of a nation. Milani: What I would hope people would take away from it, is that as a nation we have to stop believing in these mythologies. We have to start looking at the evidence and the reality and come to a nuanced judgment. The royalists want us to believe that this is a national uprising, that the 28th of Mordad was a national uprising and that nobody had anything to do with it other than the military and the people of Iran, who rose up against Mossadeq. I think that's false. The Mossadeqists want us to believe that this was a CIA coup or a CIA-British coup and there was nothing wrong with any of the Mossadeq policies. They want us to believe that the only reason Mossadeq fell was because of the CIA intervention, and had the CIA not intervened, Iran would be a democratic heaven today. I think that's false as well. Memarian: In writing the book did you find any parallels between the Shah's time and the ruling of the ayatollahs in Iran now? Milani: Absolutely! I think that there are so many parallels. For example, if you look at the documents and American, British, and CIA reports, you see that between 1975 and 1978, three years before the revolution, almost universally, and I say almost because there are some dissenting views, the view of the Americans and the British is that the Shah is here to stay, the opposition is completely demoralized, everyone is only thinking about their own interests, the Savak is in full control, and the military is unbeatable. In a study that the British commissioned right after the fall of the Shah, they tried to understand why they had been so wrong. The study is called British policy in Iran and was written by someone named M.W. Brown and is now available online, almost 97 pages. The person who had access to all of their files, said they underestimated the brutality and thus the flight of the secret police, they did not understand the public perception and resentment of corruption amongst the ruling elite. And they did not understand the power, the pervasive power, of the opposition. I think this could be almost exactly a recipe for what is wrong with some of western thinking about Iran today. They don't understand how fed-up people are with this regime; they don't understand how corrupt this regime is. And they don't understand how brutal the political structure of this regime and the military and [the Revolutionary Guards] IRGC and the intelligence Ministry is and thus they are missing the boat. The other parallel is between [the Supreme Leader, [Seyyed Ali] Khamenei and the Shah. When problems began to arise, early on, the Shah did not believe they had internal domestic resources. The Shah believed that the CIA, the British, communists, oil companies, or all of them, at one time or another, gave resources to the culprits. They were the guilty ones who were making this revolution, he thought. So, instead of addressing the domestic problems of discontent in the country, he kept trying to solve his problems by accusing these different sources, or trying to silence the BBC or the Western media, never understanding that the problem was that he, himself had created a middle class, an educated class, a working class, that expected more of life, that wanted a share in the political structure. So, instead of addressing that issue, he kept trying to solve the conspiracy that he thought was against him. Khamenei has made the exact same analysis. When 3 million people came out in the streets, his instinct was not to say 'well I've made some major mistakes, [and that] there are millions who are opposed to me and are risking life and limb in order to say 'death to the dictator.' Instead, he decided to kill the messenger. He deiced to accuse the Western media, he decided to accuse you and me and Yale and other universities of instigating this. This is exactly what the Shah initially did. And by the time he tried to address the domestic situation, it was too little, too late. I absolutely believe, though I can't prove this--its' just my sense after having read all that I have--that if the Shah had made a third of the concessions that he made in 1978 under duress 2 years earlier, when he wasn't under duress, today we might have been living in a very, very different Iran. There was no inevitability about the clergy coming to power in Iran; there was inevitability about one thing--democracy. And if the Shah had understood that he could have made Iran a democratic monarchy. And if Khamenei understands that he could have accommodated [Mohammad] Khatami, which was the last hope for this regime's survival. [Khatami], in my view, was Khamenei's last chance. Memarian: Just to refer to another parallel that I see in one of the chapters, 'Cat On A Hot Tin Roof', you mention that the Shah or people close to him suggested that the American Embassy should avoid any contacts with dissidents or even opposition elements of the Parliament [or Majlis]. Today, not surprisingly, it's very costly for the opposition or anybody to be in touch with embassies in Tehran. So how does such paranoia plays out in Iran's politics and its relationship with the world today? Milani: Yes, that's one of the more remarkable cases of double standards. The clergy in the current regime, when they were among the Shah's opposition, had a great deal of contact with the American Embassy and with other embassies. They solicited contacts, they volunteered for contacts. As I said, Ayatollah Khomeini volunteered to contact Americans in Paris. Now, the mere fact that [Mir Hussein] Mousavi [the opposition leader], for example refers to an American report is claimed by Kayhan [a radical conservative newspaper in Iran] to be once again another proof that he is an agent of the CIA. First of all, the hypocrisy is remarkable! Second of all, you are absolutely right. The Shah began pressuring both the Americans and the British to stop their contacts with the opposition. And eventually, he didn't get it in 1959 because he wasn't in a position of power but by 1965 he got it. By 1965, both the Americans and the British stopped contacts with the opposition inside Iran. The result was that they failed to understand what was going on in the country. They failed to understand the level of deep-seated resentment in the country and as a result, by the time they found out that something was wrong, something was rotten in the state of Denmark, as Hamlet would say! By the time they found this out, it was far too late. There was nothing they could do. And as a result of the Shah's paranoia and belief in conspiracy theories, he would not even tolerate the American Embassy's inviting Ali Amini, the Prime Minister of the country, someone who had previously been the Secretary of the Treasury, and who had been Iran's Ambassador to the US, to be invited to a dinner at the American Ambassador's residence. He threw the equivalent of a diplomatic tantrum when this happened. So, this kind of lack of contact simply made these countries unaware of what was going on in the country, and it made whatever contact there was to be even more illegal, more underground and ultimately more limited, and the result, I think, that was disastrous for both the western powers and for Iran. Memarian: It seems that the U.S. government simply suffers from a sort of severe disconnection disease in order to lay out a long term strategy in dealing with Iran. How might this lack of connection and, even misinformation they could receive from second hand sources, contribute to a series of miscalculations, misunderstandings, and unrealistic policies? Milani: I think part of the problem of the U.S. policy in Iran or the U.S.' inability to develop a policy on Iran that has any sustainability is that if you look at it, the US really has not had a strategy on Iran for 30 years. They've gone from one reaction to another. A kind of a strategic vision that is based on a concrete realistic intimate understanding of the situation has been wanting. And one of the reasons it is lacking, and it's difficult to make, is that they have no embassy. When you have no embassy, when you have no diplomats telling you what is happening on the ground, when you don't have intelligence agencies doing exactly what intelligence agencies are supposed to do, which is report about the realities on the ground, and then you can't come to a good assessment. ...When you don't have an embassy, you become reliant on a phone bank in Istanbul calling 700 people inside Iran, 702 to be exact, and asking them what their opinions are on very sensitive issues. And to think that you could possibly get a correct answer from a call from Turkey to an Iranian living under the current oppression in Iran is a level of desperation that is hard to fathom. It shows a desperate need for information. It shows a level of desperation in accessing information that is truly remarkable; hard to fathom, hard to understand. Excerpts of this interview were published by IPS News Agency, and reprinted by Lebanon's Daily Star.